A massive refugee crisis, an aging population, economic challenges, and political upheaval are hitting Europe all at the same time. The world does not stay the same. Consequently, the churches that can survive and even flourish are those that are willing to change, take risks, and use crisis to create opportunity. In a variety of locations in Europe, the Church of God congregations are embracing out-of-the-box thinking and challenging themselves to do more than they thought was possible. Christianity has been on steep decline in Europe for a century and, even more than in the United States, churches easily decide to coast and go extinct. Congregations get older, the church doesn’t reflect the neighborhood, and older leadership prohibits new leadership from emerging to give the church new life. Fortunately, many congregations in Europe are taking bold chances. 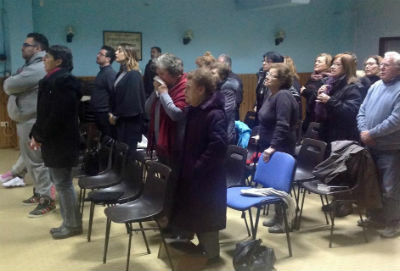 In Rome, the Ostia Church of God is entering into a major time of re-organization that will lead to more laypeople being involved in ministry, and a new vision and strategy for evangelism developed. All in the process admit that it is very scary, but after forty days of prayer and repentance, a new commitment was made to take the narrow road, not the broad one. In Hungary, older congregations that were acting apart are now unified as one church, in multiple locations, with leaders in their thirties that have brought more unity to the country than we have seen in decades. The German Church of God leaders say they are in disbelief at how healthy the Hungary church has become in the past few years. Eventually, Hungary hopes to plant a new church. In Greece, new vibrant congregations are emerging beyond the city of Athens where growth was stymied. In the United Kingdom, the churches have been challenged to become more global and inner-connected with the Church of God, and are planning regular travel to visit Church of God congregations, beginning with Egypt and the Middle East. The Paris Church of God is seeing growth as young Muslims convert to Christianity. More French people are joining the church, as well, and work is expanding to countries in the Islamic World. The young generation there has been filled with brilliant ideas that are giving new life to an older congregation. It is estimated that 90 percent of churches in North America are plateaued or in decline. The situation is worse in Europe. The only way to truly keep growing and being healthy is by embracing risk and depending heavily on God. It may be years before we see the full effects, but the process of humbling oneself pleases God and allows him to work. Keep an eye on the Church of god in Europe! Patrick and Jamie Nachtigall serve as regional coordinators for Global Strategy in Europe and the Middle East. Learn more about Global Strategy at www.chogglobal.org. This entry was posted in All Church of God, Global Strategy and tagged awakening, church growth, Europe and the Middle East, Global Strategy, Greece, Hungary, Paris, Patrick Nachtigall, refugee, revitalization, revival, risk, risk-taking, Rome, transformation. Bookmark the permalink.